Perfect for hanging a favorite feeder, basket or windchime! 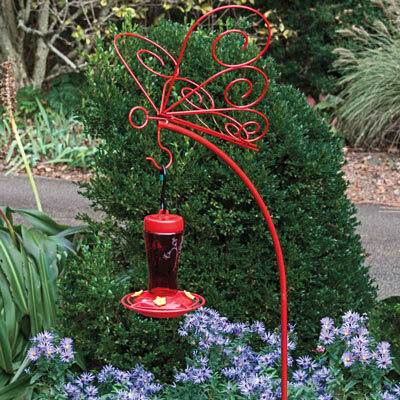 Beautiful as well as functional, this charming shepherd's hook with its 3-D butterfly will really show off your favorite feeder! The butterfly also provides a handy place to perch for incoming birds, especially hummingbirds, who spend a lot of time perching near a food source. Made of metal with a durable, bright red powder coat finish. 61″ H.